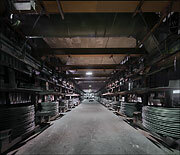 The rolling mill in Hagen-Wehringhausen was founded under the name Asbeck-Osthaus-Eicken & Co.as a forge in 1851. Since 1855 a rolling is in operation. In 1887 the name changed into Eicken & Co. And an open hearth shop including three furnaces and a blooming mill were built. In 1931 Eicken was fusioned with the Harkort steel company from nearby Wetter now called Stahlwerke Harkort-Eicken. In 1951 the mill became part of the newly founded Stahlwerke Südwestfalen. 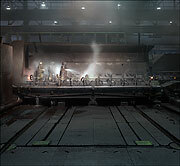 Other branches where the former Brünninghaus rolling mill in Hagen-Vorhalle, the open hearth shop in Hagen-Eckesey, the steel mill in Siegen-Geisweid and the rolling mills in Werdohl. Takeover by Krupp in 1974. 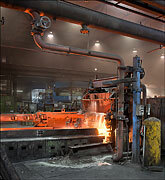 Today the Wehringhausen mill is a speciality steel wire rolling mill for which the raw material is produced at the steel mill in Siegen-Geisweid.